A new step toward the perfect acoustic absorber. 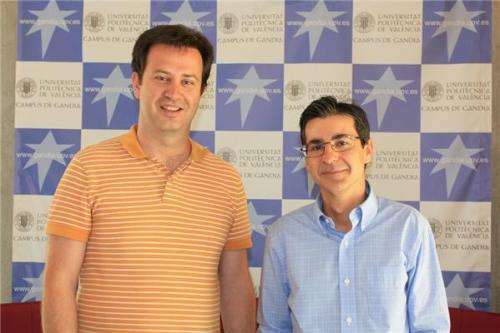 Researchers of the Universitat Politècnica de València at the Campus de Gandia have designed and experimentally evaluated in the laboratory a new structure made of conventional porous materials –used in the construction industry- that permit the complete absorption of sound at a wide range of frequencies. The Technical University of Denmark, the LUNAM Université of Le Mans (France) and the Institute of Photonic Sciences (ICFO, in Spanish) have also taken part in this project. The results have been released in Scientific Reports, from Nature Publishing. "Our study tackles one of the most important problems of society today from a new point of view: the design of materials and surfaces able to significantly reduce noise. In view of the results, we believe we have taken an important step toward the perfect absorber. And that has been done just by reconfiguring a known material," says Víctor Sánchez-Morcillo, researcher at the Campus de Gandia of the Universitat Politècnica de València and director of the Master's Degree in Acoustic Engineering, taught at this campus. In their work, the researchers have demonstrated how the designed structure achieves extraordinary sound absorption using an apparently contradictory strategy: the sound attenuation increases when the quantity of absorbent material is reduced. This way, a totally reflective surface becomes a perfect absorbent despite the fact that, for the most part, there is no material that absorbs sound. The key to understanding this reaction is the following: the new configuration of the material, in periodically distributed panels, allows sound waves to easily enter the material and increases the interaction between it –the wave- and the structure, thereby increasing the absorption. As for its possible applications, Víctor Sánchez says that the study's conclusions open a new way to design new noise reduction solutions such as the development of new baffles to reduce noise pollution caused by roads, railways, etc. How do liquid foams block sound?